Are you renovating or building a brand new home? Here are six simple, yet effective, ways to make your home more energy efficient, saving you time and money in the long run, writes Chris Godden, owner and director of Doberman Windows and Doors. Passive design is when the design of your home takes into consideration the surrounding environment and maximises the use of sunlight and local climate to produce a comfortable environment inside the home. Passive design can greatly reduce, if not eliminate the need for heating and cooling, which accounts for approximately 40% of a home’s energy usage in Australia. Passive design uses heat from the sun and cooling breezes to ventilate the home, regulating temperature in your home year round. Most easily achieved with new-builds, you can orient the home correctly, maximising sunlight in winter and shade in summer. The design of the roof, walls, windows and flow of the spaces inside your home will all have an effect, and if executed correctly, will result in a highly economic and efficient home. Check out this home in Germany, which rotates to harness the energy of the sun. It’s called the Heliotrope and is in fact energy positive! After passive design, insulation is probably the most important element to home energy efficiency. The best part of this is that it can be added to existing homes, in addition to renovations and new builds. Correctly insulating your ceiling and walls reduces the amount of heat entering your home in summer, and keeps the warmth in during the cooler months, saving you from spending money on energy escaping through the walls. Just as you need to insulate your walls and ceilings, properly ‘insulating’ your windows will make an enormous difference to your energy usage. Windows are generally considered an energy drain, because heat travels straight through a single pane of glass. Double glazing, however, which is made of two panes of glass with an air gap between, stops the heat flow, reflecting it back inside in winter, and back outside in summer. Contrary to what some people think, double glazing is not only suitable for cold climates, in fact it is equally as effective in the heat, preventing the hot sun rays from entering inside. New technology has taken energy efficient glass one step further with thermal glazing. Thermal glazing incorporates double glazing with a transparent coating for even better reflection of heat. Thermal glazing, when installed with a double glazing unit, provides up to 68% better insulation than standard single glazing. Ensuring your home has natural ventilation can mean the difference between a hot, unbearable night’s sleep and a cool, fresh home. With correct cross ventilation, an evening breeze and natural air flow can flush out hot air built up in the home. When designing, renovating, or simply replacing windows in your home, ensure you have openings opposite one another that will allow air to move through the home. In a narrow terrace home for example, this may mean installing a strong Invisigard security door, combined with large bifold doors in the living room at the rear to allow the air to move from front to back. You could install ceiling height windows that can be opened at night during summer months for extra ventilation. Finally, installing ceiling fans will assist the air movement through the home, allowing fresh air to move through more quickly. All appliances in Australia are given an energy rating, clearly displayed on them. By choosing an appliance with a higher energy star rating, you can save a great deal of water, energy and money. Similarly, you can choose efficient shower heads, toilets and LED light bulbs to save your usage. One super simple way to reduce the heat your home soaks up is to provide proper shade to windows and outdoor areas. Adding wide verandahs to your home that angle upwards will provide sufficient shade in summer, while still allowing the winter sun to stream inside. You can provide shade with outdoor blinds and awnings that protect your windows from sunlight, but can be retracted to allow the light to enter in the evening and cooler months. There are plenty of other ways to add shade to your home including outdoor sails and large deciduous trees that provide shade in the summer and lose their leaves for the winter sun. 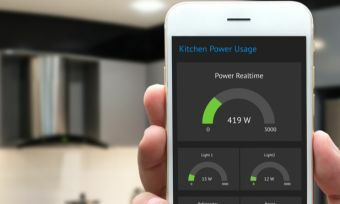 Making your home more energy efficient doesn’t have to cost the earth, in fact it can save you money in the long run while helping the planet at the same time. It doesn’t matter if you’re renovating, extending or building a brand new home, by using these simple design principles you can create a stylish, economical and efficient home.